Kale is a non-starchy vegetable and can be a wonderful addition to a diabetes meal plan, adding volume, flavor, fiber, color and many other nutritional benefits. This earthy-tasting dark leafy green is rich in antioxidant carotenoids and flavonoids which have been shown to reduce risk of certain cancers. Kale is a cruciferous vegetable and belongs to the cabbage (Brassica) family. 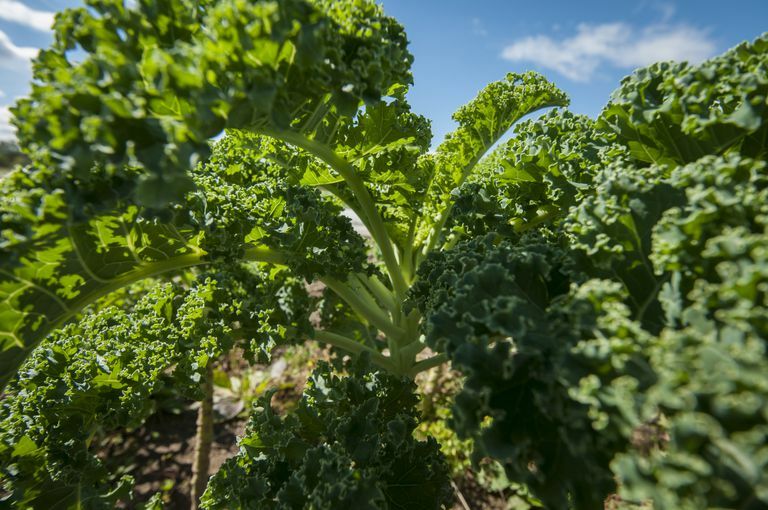 What is the Nutrition Content of Kale? Kale is low-calorie food, rich in fiber, vitamin C, vitamin K, vitamin A, beta carotene, zeaxanthin, manganese (micronutrient that helps to make and break down protein and sugar), and lutein. Studies have shown that diets rich in lutein and beta carotene (carotenoids) may help to support eye health, which is important for people who have diabetes who may more susceptible to certain eye conditions.It is also good source of calcium, potassium, vitamin B6, iron, and copper (which assists antioxidant enzymes). Adding more potassium rich foods may help to reduce blood pressure, an important risk factor for people with diabetes. Nutrition Breakdown: One cup of kale is about: 30 calories, 0 g fat, 29 mg sodium, 7 g carbohydrate, and 2 g protein. One cup also provides about 4% of the recommended daily allowance (RDA) of fiber, 9% of calcium, 9% of potassium, 10% of copper, 26% of manganese, 684% of vitamin K, 9% of vitamin B6, 206% of vitamin A, 134% of vitamin C.
Are There Any Concerns About Eating Kale? Kale's high percentage of vitamin K, an essential nutrient for blood clotting, means that for those people with cardiovascular disease who take blood thinners, such as coumadin, intake of kale and other green leafy vegetables rich in vitamin K should be monitored. Typically, people can maintain good blood levels when eating cruciferous vegetables, such as kale when they are consistent with their intake. Therefore it is important to speak with your health care provider before adding kale to your diet if you are taking blood thinners. Kale comes in many different varieties, such as curly, ornamental, and dinosaur. Kale can be prepared many ways such as sauteed, steamed, baked, boiled, juiced, and eaten raw. Steaming might be the best healthiest way to eat kale because it helps to maintain vitamins and minerals that can be lost in cooking when boiling. Aside from eating kale raw, steaming is also the most low calorie way to eat kale which can help facilitate weight loss. When choosing kale, look for dark-colored leaves with hardy stems. Choose kale with smaller leaves for more tenderness and better flavor. Do not wash kale when storing and store in a sealed plastic bag with as much air removed as possible. This will help to extend its shelf life and keep it fresh. A simple way to prepare kale is to steam it for five minutes. Chop and add to stir-fries, soups, stews, and casseroles.